Yesterday I had the pleasure of attending the Toronto edition of the BlackBerry 10 Jam World Tour. It was a packed house at the Westin Harbor Castle in downtown Toronto. Normally I'd bike downtown since it's only a 25 minute ride from my house. But it was 35 frikkin' degrees Celcius outside. That's 95 F for the rest of you. Crazy hot. So I took the subway which I don't do much these days. Nice to see so many Torontonians still sportin' a Bold or a Curve on their commute to work. Canada is still holding strong as a CrackBerry Nation. So I spent the day listening to RIM talk about BlackBerry 10, and talking to developers. Whenever I'd be talking to a developer I would just ask one simple question. I wanted to know why each developer had chosen to spend time at this event, and why they'd decided to code for BB10. The answers were remarkably consistent. First, RIM is actually seeding out real hardware. On top of the great developer tools that have been published, the developers really love having real world hardware. They want to side load apps to a device, not show off their work on a simulator. One developer even joked with me that the dev alpha simulator doesn't even fit on his laptop screen. Second, the aspect of competition kept coming up. It's way easier to compete in App World versus the App Store for iOS. Developers want to make money. BlackBerry people spend money. So you have less crowded shelves, and a hungry audience. This is something devs like. Third, the tools really are good. This keeps coming up over and over. Devs talk about the work required to write an app using Cascades and the native tools and they're thrilled by not having to hand-code basic animations or other flashy UI elements. Seeding real hardware is working for RIM. I talked to newbie developers who are just out of school, and more senior folks who understand the difference between using a simulator and using the real deal. Real hardware is just SO much better when it comes to testing apps and showing them off to others. RIM has never done this before. It's a huge change in direction for the company. But it's working. 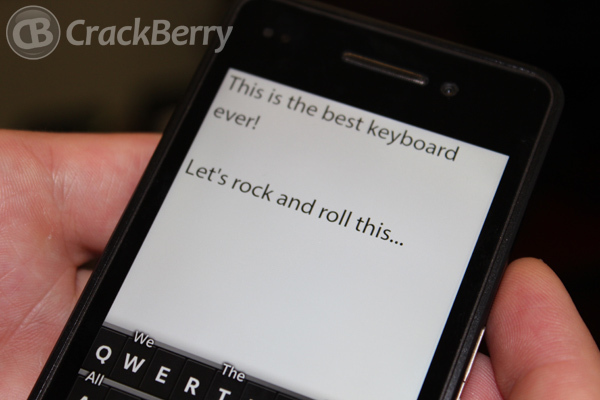 The BlackBerry 10 Jam World Tour will seed out 5000 devices. That's an absolutely awesome start to a new platform.